Patrick and Ryan Wolfe, Feb. 1, 2006, 8th grade at Mackintosh Academy, Littleton. It all started in the school year 2005-2006. Patrick and Ryan were both 8th graders at Mackintosh Academy. I found a couple clips of video of the boys from February 1, 2006 that were on a camera that Patrick had taken to school that day. I cannot post the video to Wordpress with my current package, this image is a screen shot. The boys were talking about a book they were reading for class. It was a wonderful slice-of-life thing to find 5 years after Patrick passed away. Ryan died just weeks after his HS graduation, also at age 18. He had planned to be a pilot. Ryan's mom, Nancy, has become a friend through our Healing Moms group. In fact, we had met a few times before Nancy and I realized that our boys had been at Mackintosh together that year. Patrick was there for 6-8th grade, Ryan just for 8th grade. Both boys enjoyed their time at Mackintosh and Nancy suggested that we do something to honor the boys and help the school. That was a fabulous idea, so began the project planning about a year ago. We were intrigued by the idea of an aviation theme since Ryan wanted to be a pilot and Patrick also loved planes. We also thought it would be something that would excite the kids. We spent time looking for two-seater airplane playground equipment, but quickly found out that it was very expensive and required installation that wasn't going to work at Mack. As it turned out, they already had a rocking two-seater plane anyway. In collaboration with the Mackintosh early elementary teachers and administration, we decided to replace the sandbox, which was just the right size but showing it's age and create bi-planes in both of the boy's names to adorn the large, plain 12 foot tall fence. As most of you know, we are still blessed with regular visits and interaction with many of Patrick's friends. This project truly was a group effort, with all of the boys (and Emily of course) pitching in throughout the month of October as the plans turned to production. The first thing we did was cut out the planes. Jerry took the lead, based on a simple photo that I found on Pinterest. The day he cut out the planes, Brendan, Avery and Richy were here to help him and to assist with the clean up. Next up was sanding and painting the planes. As a family, we decided that Patrick’s plane should be the color of the Irish flag. Nancy and her husband, Norman, wanted Ryan’s to be in his favorite colors, the same kelly green, black and white. The Dads sanded the plane pieces, which turned out to be a great cathartic exercise for Norman and Jerry. Nancy and I spent a morning painting the plane pieces in my garage, which was also cathartic for us and gave us some time to chat about life, loss and our other kids! I added coats of paint and touched up spots, as needed, when Jerry assembled the planes. I painted the boys’ names of the planes, which I blogged about at the time. Jerry assembled them and they were ready to be installed. Then we turned our attention to the sand box. Upon inspection, Jerry determined that the 4" x 4" posts that underpinned it were still in good shape. We rented a U-Haul truck to get it to our house, but only after I tried to retrieve it in my mini-van by myself. Note to self, measure the space in the back of the van BEFORE rolling a square, 100 pound sand box down to the parking lot. It was about 4 inches too short with the legs on the sand box. The request from the Mackintosh team was to use Trek instead of wood so that there wouldn't be any splinters or the need to re-paint the sand box over time. None of us had worked with it, but we learned how to cut and drill it and created the sand box with relatively minimal frustration. Leisa and Richy were great helpers to Jerry at this point in the project. I helped by slathering the wooden parts in exterior polyurethane. Installation day was Saturday, October 29. The morning started with Evan coming to let us use his truck to get the sand box back to Mackintosh. Being Halloween weekend, he turned up dressed as Fred Flintstone for work that day. He borrowed the Sky and left us the truck. The picture I have only in my mind is Evan driving out of the hood with the top down in the Sky, dressed as Fred Flintstone. Priceless. Arriving at Mackintosh, we were greeted by Nancy and Norman, as well as Christine and Martin Remy. Their son, Ben, was a friend of Patrick's while they were at Mackintosh together. Christine saw my post that we were installing and needed help and they showed up to assist us, that was such a great surprise. Jerry's brother, Marty and his family also came down from Evergreen to assist. Of course Tyne and Shane were there for us. Brendan and Richy had to work that day. Emily served as our team photographer, capturing many of these images as the rest of us worked on the installation. Installing the new playground equipment was so much fun and so fulfulling. It was a picture perfect day. Next we hung Ryan's plane, which went off without a hitch. The propellers on the fence were my idea. I was concerned that the kids would be frustrated that they couldn't play with the airplanes. I wanted them to have manipulatives and propellers seemed like a good idea, in line with the aviation theme. Jerry informed me that he had not signed up to install propellers, I was on my own. So I ordered propellers online and then took them to Ace Hardware and got bolts, washers and nuts for each of them. The problem that I did not anticipate was how much brush there was between the two fences. Shane volunteered to climb behind the fence with the bolts for all 14 propellers and install them as the guys on the front side drilled holes and put the propellers on the fence. He said he knew Patrick was laughing at him crouched down there. Yes, probably true. I am so thankful that he was willing and able to make my vision of propellers a reality. It turns out that the kids LOVE the propellers. Finally, we took some group photos. The feedback from Mackintosh has been great. The kids just love the propellers and the fence is marked where they’ve been spinning them. 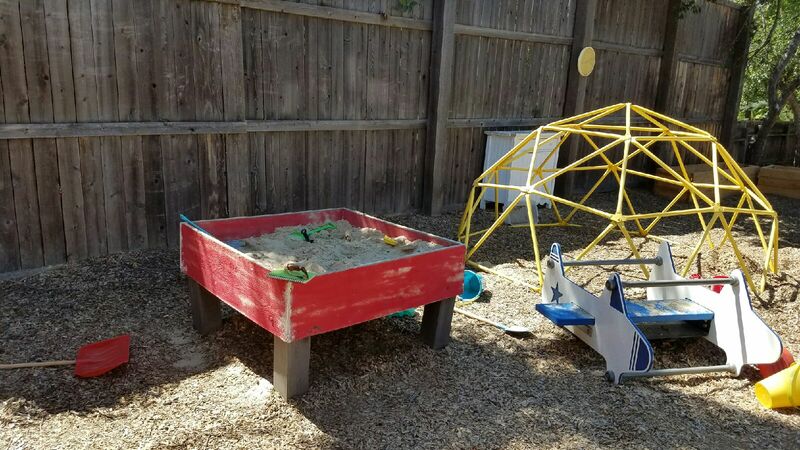 The sand box is a hit and is always full of buckets and shovels, lots of creative fun every day. I will add photos of the kids once I get them. Meantime, I’ll close with this one that means the world to me. Mr. Pausback, who was Patrick’s favorite teacher, happened to stop by in the midst of the installation. It was great to see him and his reaction to our creative endeavor. Updated: 12/1/2016 Pictures of the kids playing with the sand box and propellers. It was totally worth it!